What sort of inequality harms growth? Drawing on harmonised data covering the OECD countries over the past 30 years, the econometric analysis suggests that income inequality has a negative and statistically significant impact on subsequent growth. In particular, what matters most is the gap between low income households and the rest of the population. In contrast, no evidence is found that those with high incomes pulling away from the rest of the population harms growth. The relevant table from the paper (Table 2) is shown below. This finding doesn't provide any support for what I regard as one of the most plausible mechanisms through which inequality has been postulated to harm economic performance, namely the tendency for the rich to capture and exploit the political process for their own ends. 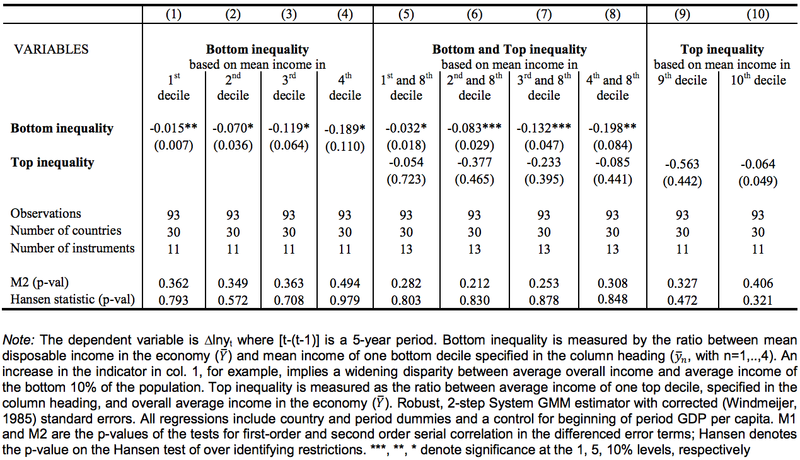 Incidentally, the OECD paper also carried out a systematic review of the previous literature on inequality and growth (see Table A2.1). Out of 17 studies, I count 13 that found at least one negative effect, 9 that found at least one non-significant effect, and 7 that found at least one positive effect. Quoting again from the paper, "That survey highlights that there is no consensus on the sign and strength of the relationship". On the other hand, the balance of evidence does tip slightly in favour of there being a negative effect, at least within the range of empirically observed variation.